Do you have a trunk disease? Publications & Presentations Coming Soon! Our goal is to develop a new method to detect trunk diseases by sampling asymptomatic leaves. 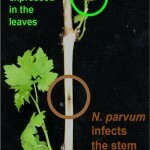 We revealed a unique set of grape genes expressed in asymptomatic leaves in the early phase of infection, using Botryosphaeria dieback pathogen Neofusicoccum parvum as a model to study host responses to a trunk pathogen. Tests are in progress to confirm specificity of these grape genes to Neofusicoccum infection, in inoculations with other trunk pathogens, common foliar pathogens, and to rule out possible interactions with drought stress. Goal – Identify almond cultivars with resistance to the most aggressive causal agents of wood-canker diseases of almond: Band canker and Lower limb dieback. Activities – Compared virulence of two Neofusicoccum species inoculated to the woody stems of potted almond plants. Peerless was the most resistant to both species of the pathogen. Carmel, Sonora, and Padre were among most susceptible, with some differences depending on the species. Susceptible cultivars had the highest mortality. Cankers were so severe in Sonora that 50% of the trees died after 10 months. This means that infections of young trees, esp. of susceptible cultivars, must be protected in young orchards. Now that we know the causal agents, we must identify preventative practices. If you have questions about our project, please contact Kendra Baumgartner. If you have questions on this project site, please contact Mizuho Nita.